‘Skin lesions’ is the generic name for a wide range of lumps or bumps that appear on the skin, through a variety of different causes. 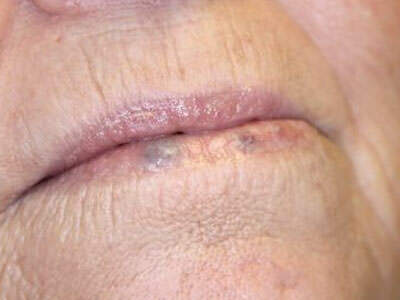 The vast majority of skin lesions are harmless, but they can cause significant cosmetic concern, and affect an individual’s confidence, or they can routinely catch on clothing (and hence be a source of regular irritation). A selection of some of the different types of skin lesions which can be treated at BrightNewMe are shown below. We treat a wide variety of lesions using two processes, cryotherapy or thermo-coagulation. The process of cryotherapy which is used, for example, to treat warts, skin tags and moles, involves the precise application of freezing nitrous oxide (-89C) to the lesion, such that the damaged cells are destroyed and eliminated. 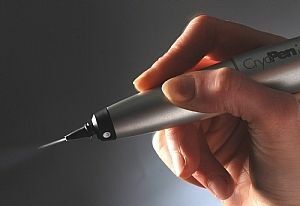 The equipment I use, a Cryopen, is very accurate so that lesions measuring just 1mm across can be targeted, with minimal damage to the surrounding tissues. 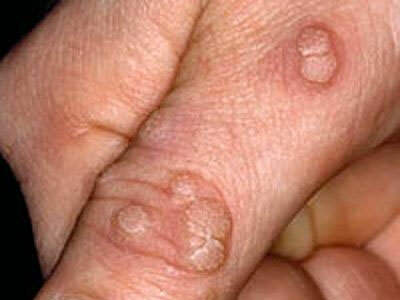 You should be aware that following treatment there will be some downtime (for example there may be scabbing and occasionally a blister at the site of the lesion) in the short term. Cryotherapy is not suitable for dark/ pigmented skins, as there is a risk of loss of pigmentation, leaving a white area. 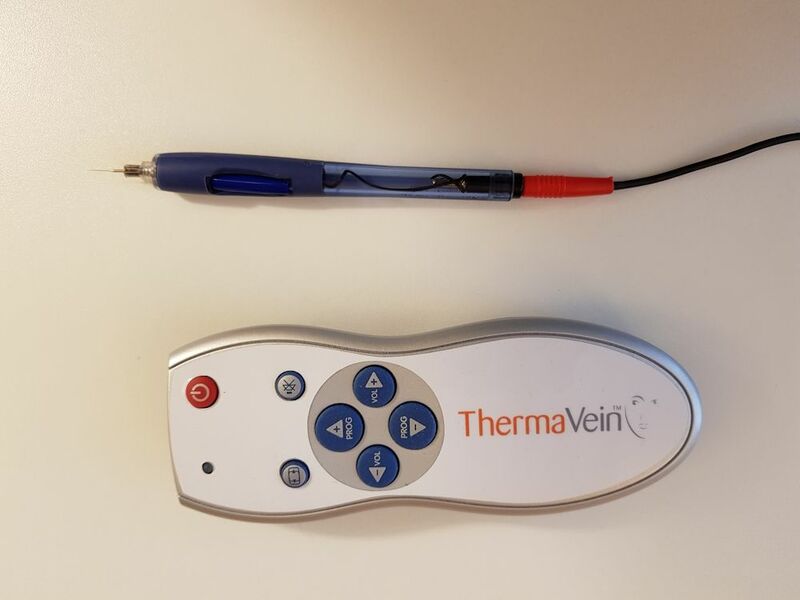 Thermo-coagulation is a procedure whereby a tiny amount of microwave energy is transmitted, through a needle the width of a strand of hair, directly into the lesion. The process is repeated to cover the entire lesion. The energy affects only the cells around the point of entry, leaving surrounding tissues unaffected. 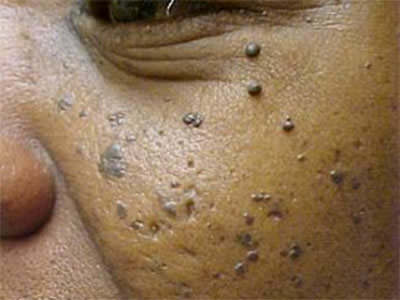 It is a technique pioneered for the treatment of thread veins, but has been shown to be extremely effective for treating some skin lesions, particularly those of a vascular nature such as red blood spots (Cherry Angiomas) and spider naevi. 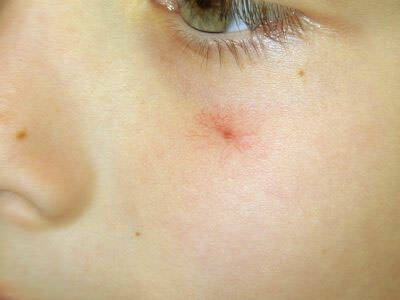 Small lesions such as sebaceous hyperplasia can also be treated with thermocoagulation. Short term scabbing is likely following treatment. 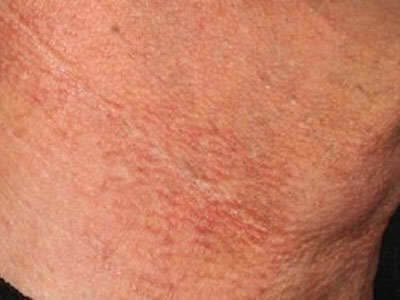 Soft lesions which frequently occur in skin folds such as the neck, or on areas where clothing rubs, and can range in size from 1mm to 5cm. Also known as Cherry Angiomas, are bright red papules on the skin, containing an abnormal proliferation of blood vessels, as shown here. Their frequency tends to increase with age. Also known as venous lakes, are usually bluish in colour, but may also be red or purple. Also known as milk spots, are small, keratin-filled cysts, with a pearly white colouration. As can be seen below, they are usually found around the nose and eyes, and can affect patients of all ages. 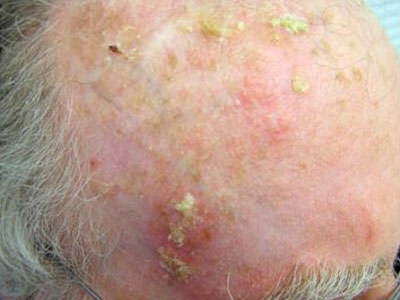 Rough, scaly lesions on sun-exposed areas such as the scalp, face and hands. 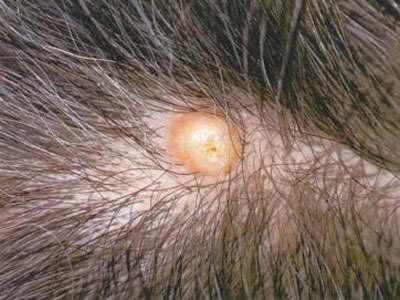 Soft, smooth lumps often found in hairy areas (such as in the scalp as per this example). They contain a white fatty substance, rather similar in appearance to cottage cheese. 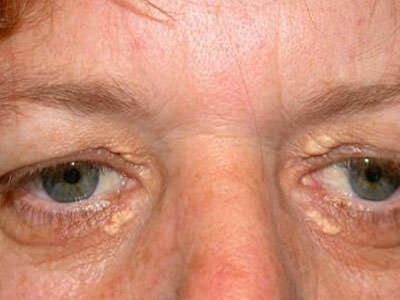 Yellowish deposits of fat underneath the skin, usually on or around the eyelids, as with this example. They can be associated with high levels of cholesterol or can be hereditary. 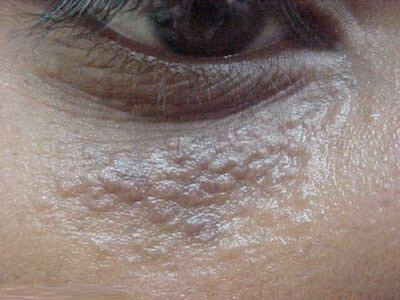 A skin condition of red or brown pigmentation, thread veins and also loss of pigmentation. 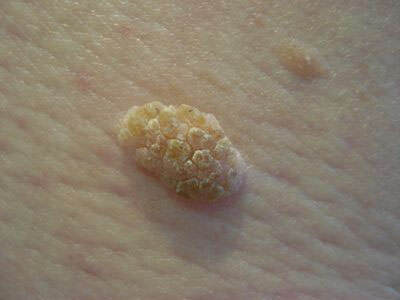 It is predominantly found on the side of the neck and also the chest. It is commonly associated with sun damage, but poses no health risks in itself. Swollen blood vessels, with reddish extensions that radiate outwards (like a spider's web). Commonly seen on the face and chest they are harmless, although the presence of numerous vessels can be a sign of a liver complaint. 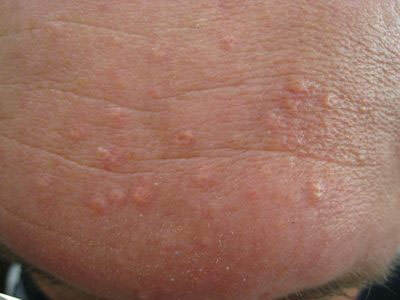 Firm nodules, often yellow-brown or pink, which commonly occur on the limbs. They may arise following trauma such as an insect bite. Generally presents in dark skinned patients (said to affect up to 35% of the African American population in the US). It causes numerous small, smooth lumps to appear, often on the cheeks (as seen here) or the décolletage. A spreadable viral condition which commonly affects children. 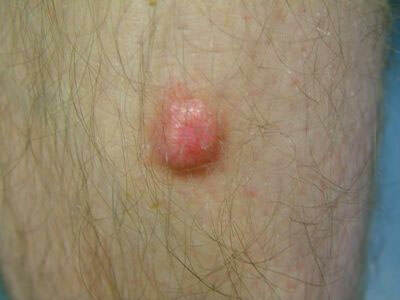 The lesions occur in warm, moist areas such as behind the knees, or in the armpits. They can be white, pink or brown. Raised, brown, warty lesions which appear to stick to the skin like barnacles. As can be seen in our example, they have a thickened surface. They are often associated with advancing age. 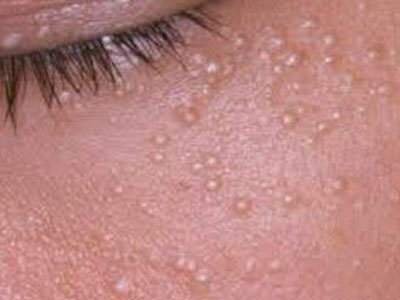 Appears as yellowish bumps up to 3mm in diameter, commonly on the forehead or cheeks, due to enlarged oil glands in middle aged and elderly patients. Harmless sweat duct tumours, yellowish in colour, often appearing near the eyes in adolescence. Of viral origin and typically affects the hands and feet (the latter in the form of verrucas). They will eventually clear on their own, without treatment (rather sooner for children, for whom 90% will resolve within 2 years). A classic, extremely common skin coloured 'mole’ which is raised, rounded or domed, and may contain in-growing hair. They appear at any stage from late teenage years to about the age of 60. Treatment costs will vary according to the nature, size and number of lesions to be treated, along with treatment method. 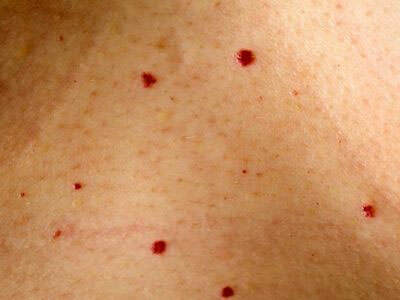 We typically ask patients to send in photographs of the lesions, for initial assessment. These are then reviewed by myself, Dr Sarah Norman, for suitability, but treatment with cryotherapy is administered by Julie and Natasha, our fully trained Aesthetic Therapists. Treatments are charged according to the time required in assessment and treatment, but by way of guidance a short cryotherapy appointment, to treat a couple of small lesions, or one larger one, would be of the order of £60. A longer appointment, to treat a few smaller lesions, or several larger ones, might be charged at £120 (more if numerous, pro-rata). Some lesions may require a second cryotherapy treatment. Severe warts can require multiple treatments. Repeat sessions are usually undertaken at 28 day intervals, and are also chargeable, although such follow-up appointments are generally quicker (with a reduced charge accordingly). Thermo-coagulation charges are £300 per 30 minute appointment with myself, Dr Sarah Norman (or £200 for thermocoagulation by Julie/Natasha, our fully trained aesthetic therapists). As with lesions treated with cryotherapy, repeat treatments may be necessary. A more specific cost estimate can be given upon receipt of a photograph of the area of concern. Please see the contact form at the bottom of this page. Please be aware that the 2 techniques we offer (freezing or burning) do not enable a tissue diagnosis – nothing is sent off to the laboratory. As such, the treatments are only offered to benign (non-cancerous) lesions. If your mole/ lesion is pigmented you will be asked to attend your General Practitioner prior to visiting BrightNewMe. This is important in order for us to confirm the appropriateness of our treatment. Although we have a dedicated page for general client testimonials, below you will see a selection of comments from patients whose skin lesions we have treated. Click on the extract to see the comments in full. I honestly can’t tell you enough how happy I am and my confidence has already changed so much since treatment. Before I came to visit you I used to wear make up most days to cover them up and I was so self conscious about travelling all the way to altrincham without it on for my first treatment and since having the cryotherapy done even after just one session I’ve probably worn make up twice maybe 3 times I feel so comfortable without it now that I don’t have the lesions on my face. I can’t thank you all enough! The scab fell off exactly a week after the procedure and today, exactly three weeks after the procedure, there is only a very small amount of redness and no scar whatsoever. I am very, very pleased with the service, the treatment and the outcome. Please pass on my regards and thanks to Julie and Sarah. Dear Dr. Norman, A very brief word to confirm that my cryotherapy treatment, a couple of weeks back, has been highly successful and effective. The post-treatment reaction and healing process was exactly as anticipated. I am a happy patient and will not hesitate to recommend your services should the opportunity arise. After living with a facial mole for most of my adult life I finally decided to do something about it. I came across Bright New Me clinic as my wife works close by. The consultation I had with Sarah was just what I was looking for. Sarah gave me some extremely useful advice and really put my mind at ease with regards the treatment she proposed. Sarah also suggested other skin related blemishes that could be treated by the same process to freshen up my 45 year old face (not her words!). The treatment went ahead in the clean safe environment at the clinic and I felt completely at ease the entire time. Everything proceeded exactly as Sarah had outlined and within days I was all healed and couldn’t be happier with the result. 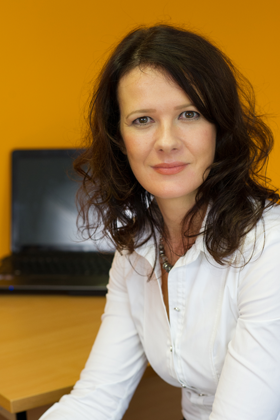 I would thoroughly recommend Sarah Norman to anyone who is considering treatment and wants the reassurance of an expert who puts their clients first. Dear Sarah, I just wanted to drop you a line to thank you for the really wonderful treatment which you gave me on Wednesday. I was nervous but you put me at ease and I was treated very kindly and with great care. The sites of my 17 skin tags are calm, I had no reaction, which I am relieved about, and I am confident I will look as good as new very shortly. So, thanks once again. I will definitely recommend you to my many friends who have various skin problems.